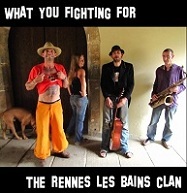 The RENNES LES BAINS CLAN are a coalition of artists from a community in the mountains of the South of France. They are about as far outside the system as it gets. Living in caravans and caves, they recorded their debut tracks on solar power!